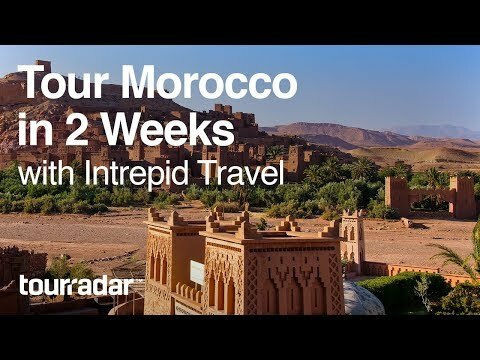 On this two-week journey with Intrepid Travel through Morocco’s landscapes and cityscapes, you’ll explore the country’s best attractions. Enveloped in the country’s warm hospitality, experience cosmopolitan and cultural hubs, desert sands, medieval towns, ancient Roman ruins, historical monuments, mountain ranges, and insane views of the ocean. Morocco borders the Atlantic Ocean and the Mediterranean Sea. This fascinating country is immersed in Berber, Arabian and European traditions, and where the fusion of old and new speaks through architecture and artwork. Morocco is also an incredibly diverse country. On the one hand, you have buzzing cities and on the other are the daily rituals of nomadic tribes. As dusk falls on your first evening in this North African gem, start in the famous city of Casablanca before going on to towns like Rabat and Fes, wandering along desert sands in the Sahara and Djemaa El Fna in Marrakech, and even visit the epic snow-capped peaks of the Atlas Mountains. As well as heading to coveted destinations in Morocco, this two-week trip also includes remote must-see spots. There’s the sleepy town of Midelt where you can watch local farmers go about their day and spend the night listening to local musicians perform traditional folksy jams. You’ll also ramble along the limestone river canyons of Todgha Gorge in the eastern part of the High Atlas Mountains, sleep under the stars in the mountain village of Aroumd and visit Ait Benhaddou, a famous ksar in the Ounila Valley and UNESCO World Heritage site. This two-week journey ends with a bang in the metropolis of Marrakesh, a happening modern city with all the splendour of the past. Marrakesh’s heady concoction of intricate lanes, souks, opulent architecture, and fragrant cuisine is the perfect finale to the best of Morocco.